Leave your mark on your community! Be part of the mosaic mural project! With your help, WIN Network partnering with Project S.N.A.P will be creating a community mosaic mural to go in your neighborhood! The giant mosaic mural will be made up of artwork drawn by people from our community like you! The mosaic mural will be on display for everyone to see in each of our 3 neighborhoods! How can I be part of this awesome project? We collected artworks at our Real Moms of Detroit Expos this summer, but don’t worry you can still participate. Go to our Contact Us form and let us know that you want to participate. We will arrange for you to receive an entry form so that you and your family can participate. We will be collecting artwork at our health equity provider education sessions and Detroit Regional Infant Mortality Reduction Task Force meetings. Stop by the Project S.N.A.P. table at our events and draw a picture. But I’m not an artist. You don’t need to be! This project is for people of all ages and you don’t need to be an artist to draw a picture! You can draw shapes, write words, and fill the page with color. Every picture will be in the final mosaic mural and will go on display in all 3 of our neighborhoods! Words like Hope, Strength, Courage, and Wisdom and what these mean to you. The neighborhood where you live. What it means to be healthy and strong for your family. How can we make sure that all babies in Detroit reach their first birthday? Where can I see the mosaic mural? Once all the artwork is collected, Project S.N.A.P will create a giant mosaic mural from all the smaller pictures. The 5’ x 9’ full color mosaic mural with your art in it will be on display in each of the three neighborhoods this fall. 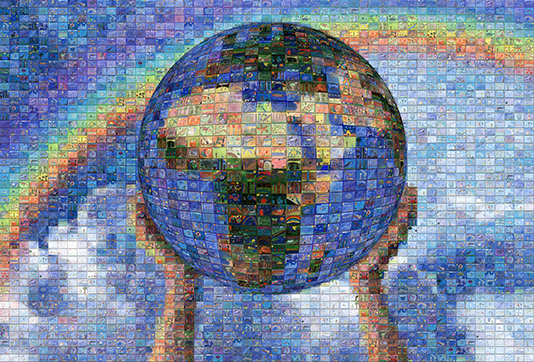 If you draw a picture, you will get your own 18”x 24” poster of the mosaic mural! If you go online to Project S.N.A.P’s online art gallery, you can find exactly where in the mosaic mural your picture is! Project S.N.A.P. is an organization that works to bring communities together to create beautiful, meaningful, mosaic murals. They use art, technology, and social media as a way to share ideas, come together around a common goal, and create change around different causes. You can read more about Project S.N.A.P and see some of their other mosaic murals on their website.